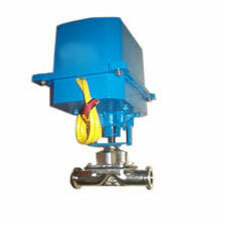 AMTECH DIAPGRAGM VALVE TC END with electric and pneumatic actuator is recommended for automation pharmaceutical , water treatment and other application. The Body material is SS 304,SS 316,SS304L ,SS316L.These Tri clover end (TC end) with mirror finish and with diaphragm special grade for pharmaceutical. The sizes of Valves are 1/2" -2"
The Diaphragm valve was developed for use in non-hygienic applications, but now a days designed was adapted for use in the bio-pharmaceutical industry by using compliant materials that can withstand sanitizing and sterilizing methods.